Bugatti is celebrating the production and delivery of the 100th Chiron. This week, the car left “L‘Atelier“ at Bugatti’s headquarters in Molsheim, Alsace, where the 1,500 PS super sports car has been hand-crafted since the end of 2016. The 100th Chiron goes to a customer from the Arabian Peninsula, who has opted for an especially attractive configuration. The outer skin of the car consists entirely of dark blue carbon, supplied with a matt finish for the first time. The paintwork of the iconic Bugatti side line in Italian red and the wheels in mink black creates a pronounced contrast. In the full-leather interior, red is the dominant colour. The price of this extraordinary connoisseur’s car is about €2.85 million net. 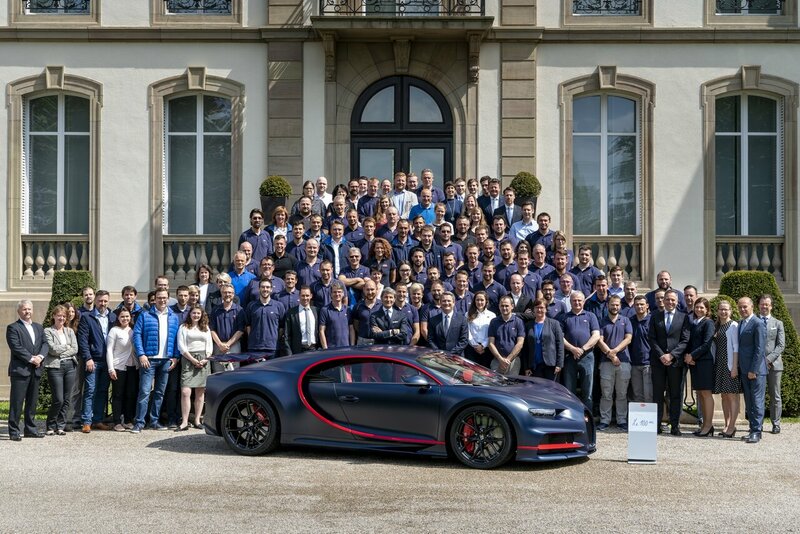 Bugatti President Stephan Winkelmann and the Bugatti team proudly standing with the 100th Chiron in front of Château St. Jean in Molsheim, the French brand's historic headquarters in Alsace.